The Rodger Dodger had a 5-year stint from 1974 to 1979 until it was recast in 1998 as part of Hot Wheels 30th Anniversary. Its second stint has proven more bountiful with over 39 releases. 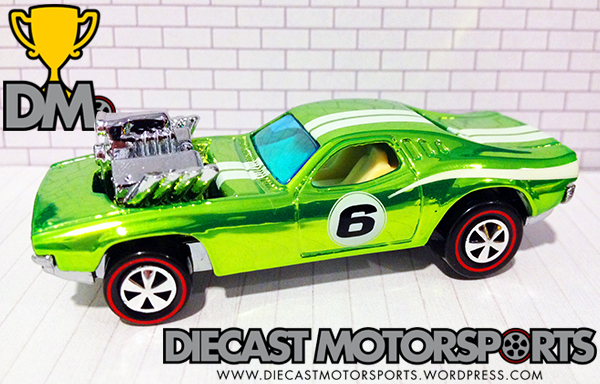 In 2006, it was given the “RLC Treatment” as part of HotWheelsCollectors.com’s Series 5 (seen below). As you can see, the “RLC Treatment” …as dubbed by collectors… is truly a privilege for a casting since it receives Hot Wheels signature Spectraflame Paint, Neo-Classics Redline Tires & Metal Chassis/Metal Body. RELEASE DETAILS: Spectraflame Anti-Freeze Body (metal). Tan Interior. Light Blue Tint to Windows. Neo-Classic Redline Tires. Chrome-Plated Base (metal). Made in China.